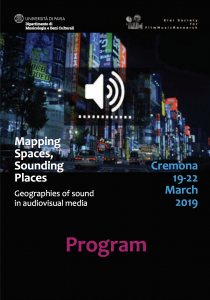 Delighted to have attended and presented some new work on Twin Peaks: The Return at this interdisciplinary conference in Cremona, Italy held end of March 2019. Mapping Spaces, Sounding Places brought together geographers, musicologists, film and television and cultural studies scholars with musicians, composers and sound designers for some terrific work, that’s got me thinking about future projects. This next block of writing on Twin Peaks, cowritten with my colleague Rupert Loydell, follows on our recent chapter in Critical Essays on Twin Peaks:The Return (Palgrave Macmillan, 2018) explores the liminal psychogeographies that connect the real world and extra-dimensional places of the series, with my focus on how this is rendered in the sound scape and Rupert’s consideration of the visual connotations of these spaces. The work has been accepted for a new edited collection on The Return, which we hope will be out later in 2019. "RT @baitfilmuk: " @BFI also acquired another @berlinale 2019 title, BAIT, the latest feature from UK director @Mark_Jenkin." Congratulation…"
"RT @Mark_Jenkin: In good company... We’ve been acquired! #BaitFilm will be in cinemas later this summer... https://t.co/e1xOKOi4Zx"
"RT @ahrcpress: . @UKRI_News are holding workshops across the UK, gathering input for a strategy to support UK AI research. It's open to res…"
Copyright KingsleyMarshall.com: Kingsley Marshall. All Rights Reserved.